From the brink of the Worldwound, where demonic hordes lay siege to the mortal realm, to the battlefields of Mendev and Nirmathas, where soldiers distinguish themselves as heroes of ideals, battle is a common part of life in the Inner Sea region. Whether practiced by virtuous crusaders, fierce gladiators, or daring scoundrels, skill with a blade and knowledge of when to use it can mean the difference between life and death. The secrets of battle might not be etched on altars or scribed in spellbooks, but they’re just as diverse and powerful as any magic—and just as available for bold heroes to claim! A who’s who of the Inner Sea region’s deadliest martial masters. Details on four types of martial training grounds—dojos, gladiatorial arenas, thieves’ guilds, and war colleges—along with rules for joining and honing one’s skills within such organizations. Rules for several types of specialized or variant combat, including the secrets of the legendary Aldori swordlords, fighting styles particular to Golarion’s many faiths, gladiatorial combat, mastering monstrous mounts, and using technology in combat. Two new cavalier orders—the order of the beast and the order of the guard—along with new context for each knightly order. More than a dozen new archetypes for all manner of brave battlers, including the gun scavenger, the monk of the seven forms, the Shoanti burn rider, and the Tanglebriar demonslayer. Two new prestige classes—the Pure Legion enforcer and the Ulfen Guard. Dozens of new magic items guaranteed to protect combatants through the most brutal battles and transform even novices into masters of war. Inner Sea Combat is intended for use with the Pathfinder Roleplaying Game and the Pathfinder campaign setting but can easily be used in any fantasy game. Written by Dennis Baker, Jesse Benner, John Compton, and Thurston Hillman. Cover Art by Yu Cheng Hong. The Aldori feats are bad. Tying ranger combat styles with a deity is a bad idea. Combat performance is big NO. The House of perfection's feats are bad. Oath against chaos is good, oath against grotesquery is ok. The monstrous feat chain is so-so. There are a couple of interesting Rogue's Skill taunt, but the others are quite bad. Firearm feats are ok. The Combat school section is somewhat interesting, but not great. I guess that It has a greater appeal to people who are accustomed to the Fame rewards mechanics. Cavalier orders are meh at best. Prestige classes are ok. Archetypes are a mixed bag, with a few couple of good ones, but the rest are quite bad. Basics- MORTAL COMBAT! Inner Sea Combat focuses on marital characters and how to build these characters and their world into your Pathfinder Game. The book starts by discussing nations and their interactions with martial characters. Next, the book adds feats and a discussion on how specialized martial characters function within the rules of Pathfinder. After specialization, the book moves to schools/guilds and rules to operate these in Pathfinder. From schools, the books present new prestige classes and archetypes for classes from barbarian to the rogue. The last section of the book focuses on magic items that specialized characters from this book might need. One of the things I like best about a book like Inner Sea Combat is that it’s much easier to see immediate uses for the new options contained within. Pathfinder is a game with a lot of options—far more than most people can easily keep track of. While generic books like Ultimate Combat may contain many interesting abilities, they can quickly get lost in the deluge as they don’t have a context to make them stand out. But with the world-specific flavour that Inner Sea Combat offers, its options are instantly more recognizable. They make both the characters and the world more interesting. There are several things in here that I already want to introduce to my own games, and any game book that fills me with ideas is a good book, in my opinion. Hoo yes, Inner Sea Magic is gonna have a little sister! As someone who prefers to play martial characters, I'm very much looking forward to this book. Finally....been waiting for this book for a long time...hopefuly it does not make fighters cool by replacing them weizard wannabes like a certain other company's book...and to stealth playtest their next edition. And just what is wrong with "common brawling" may I ask? Best way to unwind after a hard day's aventuring with worship of Cayden Cailean and a good brawl. Perhaps there'll be a dedicated tavern-brawl-fighting-style? I hope the Shoanti War Paint from A History of Ashes gets an update. This looks like it is going to be a great product! Will this book have a list of Notable Martial characters in the Inner Sea like Inner Sea Magic had for spellcasters? I hope so, that would be interesting. I hope it has rules for Military Academies, much like how ISM had Magic Academies. Lord Gyr of House Gixx. Notable level 13th rogue and veiled master-in-disguise. Ever seen Lord Gyr and a veiled master in the same room together? I haven't either. Ever seen Lord Gyr and a veiled master in the same room together? Yeah, but he was the only one there, wink wink nudge nudge. Please let there be a low-level "hadoken" ki-power for monks. I would really like some stuff like that for monks. I wonder how much Jalmeray info might be in this, given there's still no psychic magic supplement on the horizon. Will certain 3.5 prestige classes be updated to Pathfinder in this book? I'm thinking of the Chevalier (Second Darkness 2), the Justiciar (Curse of the Crimson Throne 2), the Liberator (Second Darkness Player's Guide), the Lion Blade (Taldor Companion), and the Living Monolith (Osirion Companion). And I'm hoping that those other 3.5 prestige classes which still remain in limbo will eventually get their Pathfinder updates. 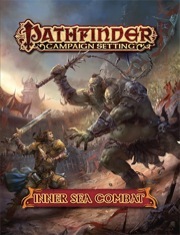 Maybe Inner Sea Gods will deal with the Balanced Scale of Abadar (Dark Markets/Katapesh), the Pain Taster (Second Darkness 3), the Spherewalker (Rise of the Runelords 2), and possibly the Brightness Seeker (Elves of Golarion), and the two upcoming Osirion/northern Garund sourcebooks will present the updated Genie Binder (Legacy of Fire 4). And where would one put the original Shackles Pirate (3.5 Campaign Setting, now replaced by the Inner Sea Pirate)? I always thought that those fog ships were a nifty ability. While I'm hoping this is mostly information for individual characters, if we get a little bit for mass combat/that whole new 'troop' idea specifically for Golarion, I will be a very happy customer. Swashbuckler alternate-class designed by James Jacobs! I'm not so sure that Paizo is too keen on releasing new classes in the non-Core line... But it'd be interesting. The best comparison for this book is Inner Sea Magic. So, don't expect new base classes, but you CAN expect some academy type stuff, lists of famous NPCs, lots of archetypes and some prestige classes and some new rules and expansions to existing subsystems for combat stuff (or perhaps some new stuff even). There's not gonna be a spell chapter, of course, but there will be a chapter of magic items and stuff that work great for martial characters. Expectations management question: Could we see some new rules to support characters outside the usual magic item expectations? Like gearless ascetic monks or warriors who keep their one special weapon throughout their career? I've done the latter by allowing a Masterwork weapon at level one for a trait. Basically Heirloom weapon without the other bonuses. Not unbalancing and the player had the weapon all the way to level 14, when the game collapsed. Is this placeholder art from the Alkenstar adventure that's not yet been released? It's from Champions of Purity. I'm relatively sure my opinion on the need for a swashbuckler base class is well established.